In the event of severe weather, please continue to check this page for updates. 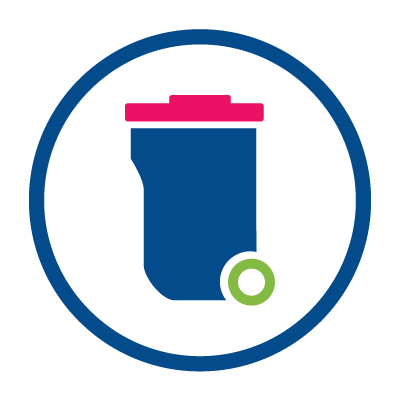 During winter weather conditions, your bin collections may be affected. We will continue to provide services as normal where possible – for the most up to date information, please check this page or visit our social media channels. If you would like to sign up to receive text alerts, please go here. Road gritting and salt is the responsibility of Kent County Council (KCC). Maidstone Borough Council's (MBC) grounds maintenance and street cleansing teams are helping to grit and salt paths where possible, however you can find more information on the KCC website. Worried about on-street parking in the snow? Maidstone Borough Council's Enforcement Team will only enforce where they can see the yellow lines, bays or markings. If covered in snow so markings can’t be seen, then we can’t enforce. If you have to leave your vehicle please ensure that it is left as safely as possible. As weather conditions improve we will enforce against abandoned vehicles that pose a hazard to other road users. The Severe Weather Emergency Protocol (SWEP) is used throughout Maidstone to help those sleeping rough in our locality during extreme weather. The SWEP solution and type of accommodation may differ from local authority area to area but will generally provide a safe and warm place for street-homeless people to stay overnight. Those needing to access emergency accommodation during bad weather should contact their district council’s Housing Options team. The Housing Options team for Maidstone can be contacted at: 01622 602000. The charity Porchlight also operates a county-wide outreach service. Call 08005677699 or visit the Porchlight website. If you have one, keep your mobile phone charged, and consider carrying a spare power bank. Keep at least one fresh, sealed bottle of water in the car. Store a warm blanket within the boot, along with protective clothing. Have a small supply of cash, including loose change within the car or on your person. A torch and umbrella will help you in dark and wet conditions. Non-perishable food will keep you going in an emergency. Wear appropriate footwear and carry a spare pair of boots suitable for walking through snow. Heat patches or glove warmers will give some warmth. Have ready access to the number and information for your breakdown recovery service. The World Health Organisation states that in the UK the ideal temperature for main living rooms - including lounge, kitchen, hallway is 21 degrees Centigrade, and for bedrooms 18 degrees Centigrade. There are other things we can do to help us to stay warm.